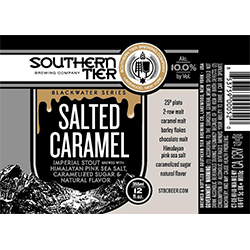 Salted Caramel is the newest in our highly regarded Blackwater Series. To say that it’s among good company would be an understatement. It joins the ranks of Warlock, Crème Brûlée, Choklat Oranj & Choklat, which have RateBeer scores of 96, 98, 98 & 100. "Beer Description" content and image are the property of Southern Tier Brewing Co. and are used for informational purposes only.